This scheme is for unemployed people, lone parents and people with disabilities who are getting certain payments from the Department of Social Protection. For current information on the scheme qualifying conditions, please contact your local Social Welfare Office. 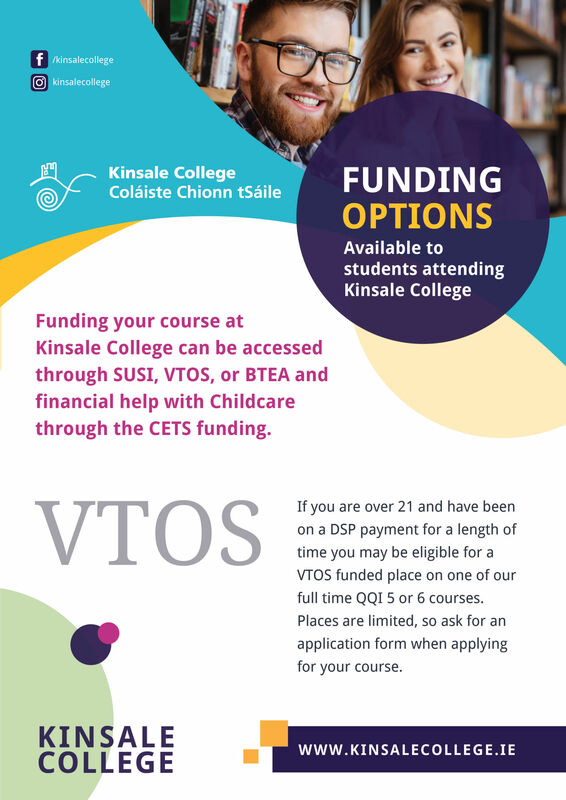 If you are over 21 years of age, unemployed and have been getting certain social welfare payments for at least 6 months you can apply for the Vocational Training and Opportunities Scheme (VTOS). The VTOS scheme provides a range of courses to meet the education and training needs of unemployed people. It gives participants opportunities to improve their general level of education, gain certification, develop their skills and prepare for employment, self-employment and further education and training. VTOS applications must be made on the special VTOS Application Form which you can download here. Students who have completed a QQI Level 5 course and are now commencing a QQI Level 6 course are deemed to be commencing a new course and must also apply to the SUSI online system. 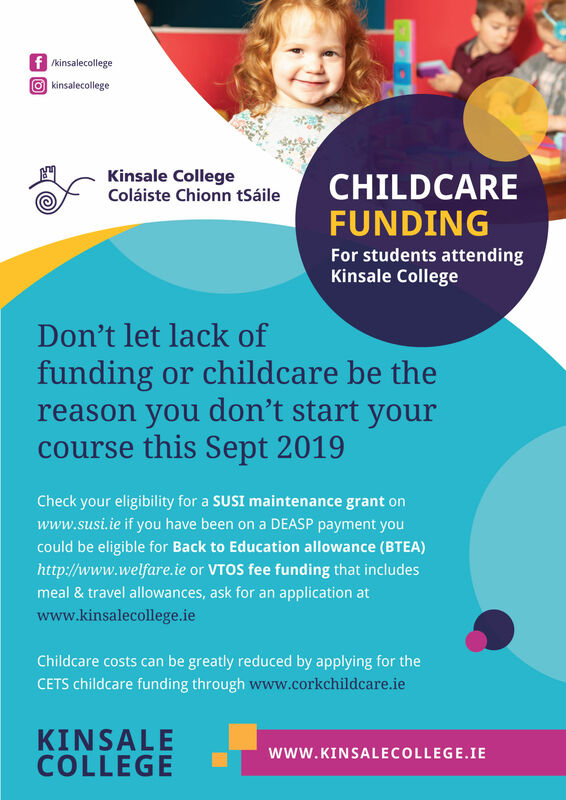 Any student coming direct from Leaving Certificate to a PLC course will not qualify for the Back to Education Allowance (BTEA) and should apply for the maintenance grant. 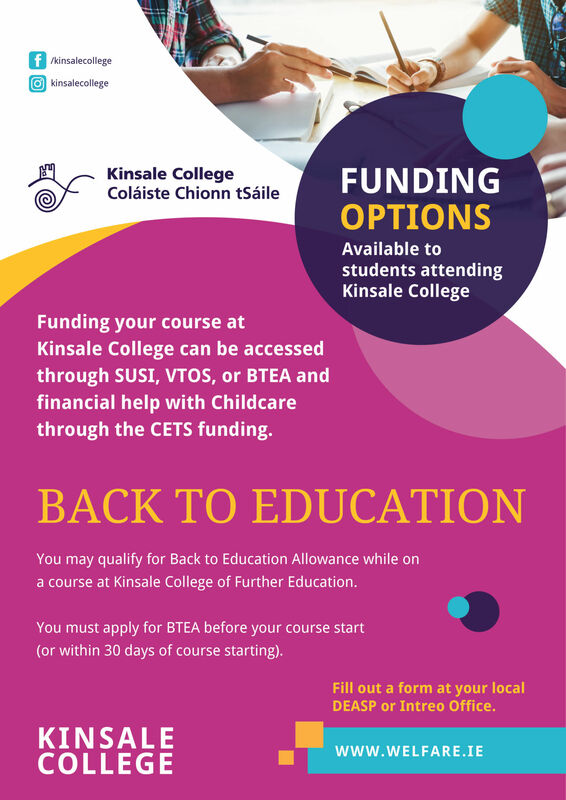 Kinsale College has CETS approved courses, which means you can avail of full-time, part-time, after school only or after-school with transport Childcare places while you study here.